We found Molly at a No Kill Shelter and have been blessed ever since. Our other dog we had for 13 yrs and my husband said he would never get close to another dog. When we got Molly she has been my dog. One day my hubby was really depressed. Molly went to him and just looked at him with those deep brown eyes and melted his heart. I luv that name Molly Marie. She is adorable. My last two dogs I had were Silky Terriers who were with me many yrs. They as all my pets thru my yrs were the light of my life. 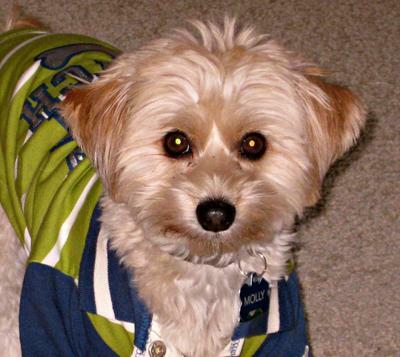 Some 30 yrs when I 1st read about Cotons was when I had a Maltese/poodle mix who had the exact temperament as Jonah today and it had been his time. Not finding Cotons at that time accessable my Silkys came in my life. Anyway enjoy ur new puppy she is absolutely adorable and keep up w/pictures and antics u would like to share. Welcome and thank u for the memories of my wonderfully loved terriers. We found our Coton, who we renamed Molly Marie McGee, nickname McGee, at a no kill shelter in Quakertown PA 2 1/3 years ago. She was found on the streets of Philadelphia. She is our first Coton and we fell in love at first sight. She is as beautiful as your little Molly Marie and we can't be more thrilled that we found this little girl and she found us. We're hooked on this breed. We are so happy for you. By the way, our little Molly is my dog but she loves my husband too. He calls her Daddy's Little Girl and the Perfect One. So I think she won him over big time.